Elections etc: Why didn't UKIP win so many seats given they got so many votes? Why didn't UKIP win so many seats given they got so many votes? UKIP did extraordinarily well in yesterday's local elections, securing a projected national share of the vote of 23%. At the time of writing they have won over 120 council seats; much more than predicted but relatively few given the number of votes they won. In the 1550+ BBC keywards Conservatives won 36% of the vote and 53% of the seats. By comparison, UKIP won 21% of the vote but only 8% of the seats. In part this difference is due to a classic First Past The Post electoral system effect, but Labour managed to get 19% of the seats on 20% of the vote, and the LibDems got 14% of the seats on 13% of the vote among the BBC keywards. 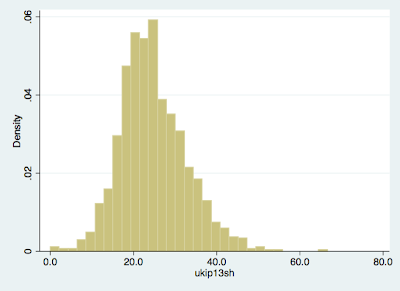 The reason UKIP did particularly badly in translating votes to seats is because their vote share is still very evenly distributed by comparison with the three main parties in parliament. The histograms below show how the Conservatives vote shares across different divisions vary much more than UKIP. 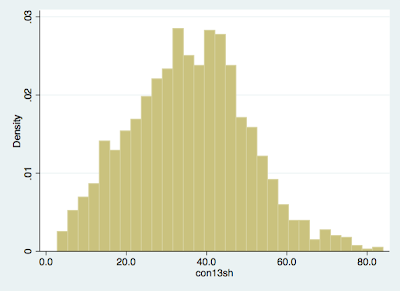 More generally, whereas the standard deviation of the share of the vote across divisions for each of the three main parties was 15 percentage points, it was just 8 for UKIP. This is a pattern that has been true in previous elections. It seems then that UKIP suffer from what used to be called the 'yellow peril': coming second everywhere and first nowhere. 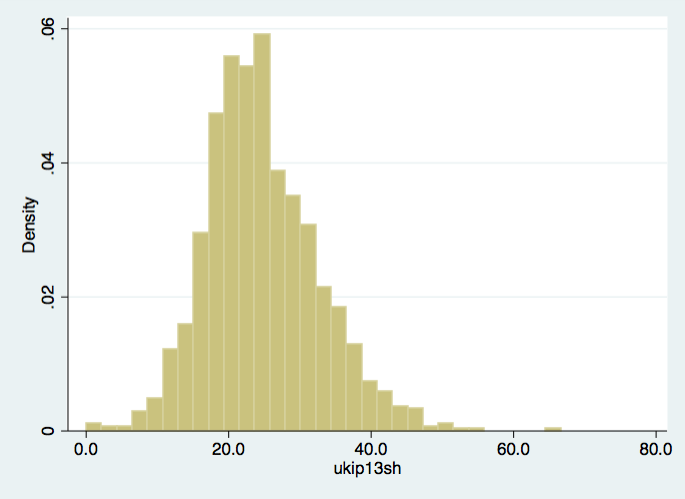 UKIP came first in 8% of BBC keywards but second 40%, more than any other party. Unless they resolve this problem they will have difficulty winning seats in a general election too. Thanks to BBC, John Curtice, Rob Ford and Jon Mellon for help with the data. The views and opinions expressed in this blog are my own and should not be attributed to my employers.